Mrs. Queen Ellis of Mt. 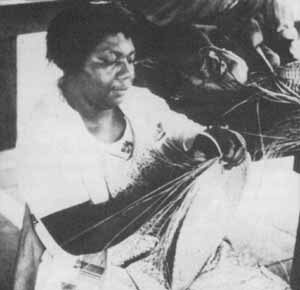 Pleasant, South Carolina making a Gullah basket (1976). The Gullah are a distinctive group of Black Americans from South Carolina and Georgia in the southeastern United States. They live in small farming and fishing communities along the Atlantic coastal plain and on the chain of Sea Islands which runs parallel to the coast. Because of their geographical isolation and strong community life, the Gullah have been able to preserve more of their African cultural heritage than any other group of Black Americans. They speak a creole language similar to Sierra Leone Krio, use African names, tell African folktales, make African-style handicrafts such as baskets and carved walking sticks, and enjoy a rich cuisine based primarily on rice. Indeed, rice is what forms the special link between the Gullah and the people of Sierra Leone. During the 1700s the American colonists in South Carolina and Georgia discovered that rice would grow well in the moist, semitropical country bordering their coastline. But the American colonists had no experience with the cultivation of rice, and they needed African slaves who knew how to plant, harvest, and process this difficult crop. The white plantation owners purchased slaves from various parts of Africa, but they greatly preferred slaves from what they called the “Rice Coast” or “Windward Coast”—the traditional rice-growing region of West Africa, stretching from Senegal down to Sierra Leone and Liberia. 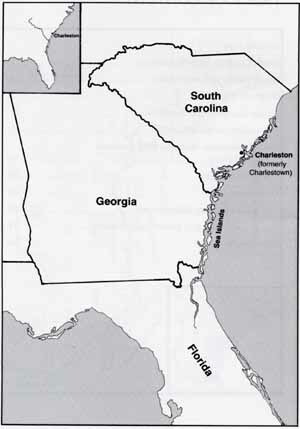 The plantation owners were willing to pay higher prices for slaves from this area, and Africans from the Rice Coast were almost certainly the largest group of slaves imported into South Carolina and Georgia during the 18th century. The Gullah people are directly descended from the slaves who labored on the rice plantations, and their language reflects significant influences from Sierra Leone and the surrounding area. The Gullahs’ English-based creole language is strikingly similar to Sierra Leone Krio and contains such identical expressions as bigyai (greedy), pantap (on top of), ohltu (both), tif (steal), yeys (ear), and swit (delicious). But, in addition to words derived from English, the Gullah creole also contains several thousand words and personal names derived from African languages—and a large proportion of these (about 25%) are from languages spoken in Sierra Leone. The Gullah use such masculine names as Sorie, Tamba, Sanie, Vandi, and Ndapi, and such feminine names as Kadiatu, Fatimata, Hawa, and Isata—all common in Sierra Leone. As late as the 1940s, a Black American linguist found Gullahs in rural South Carolina and Georgia who could recite songs and fragments of stories in Mende and Vai, and who could do simple counting in the Guinea/Sierra Leone dialect of Fula. In fact, all of the African texts that Gullah people have preserved are in languages spoken within Sierra Leone and along its borders. The connection between the Gullah and the people of Sierra Leone is a very special one. Sierra Leone has always had a small population, and Sierra Leonean slaves were always greatly outnumbered on the plantations by slaves from more populous parts of Africa—except in South Carolina and Georgia. The rice plantation zone of coastal South Carolina and Georgia was the only place in the Americas where Sierra Leonean slaves came together in large enough numbers and over a long enough period of time to leave a significant linguistic and cultural impact. While Nigerians may point to Brazil, Cuba, and Haiti as places where Nigerian culture is still evident, Sierra Leoneans can look to the Gullah of South Carolina and Georgia as a kindred people sharing many common elements of speech, custom, culture, and cuisine.